It's been fun and tough, the MFA in Creative Writing. Studying again after all the years in-between took some getting back into, but at least the topic held a fascination for me, and the challenge of writing a novel was enough in itself. It's quite a world the creative writing world. Fitting together poetry and poets, novelists and life writers, bloggers and twitterers, never mind the strains of scriptwriting for theatre, radio, tv or film, or travel writing, children's writing, other genres, writing for work; what a mess and what an industry with the usual politics, the enviable enthusiasms and the unnecessary protectors of the art. Strangely, one thing I've missed most is reading. Specifically, reading novels that I've been wanting to read, for a couple of years now. I thought I might 'discover' some new authors during the course and although I have really enjoyed a few - Jonathan Barnes, Kevin McNeil, Karen Perry, James Miller - there haven't been as many as I'd hoped to find. On the poetry front I've fared much better, quite a plethora in fact; Wendy Cope, Matthew Welton, Michael Surnowski, John Clare, John Redmond, Geoff Peterson, Lucy Furlong, Dave Russomano, Christina Stylianou amongst several more. In the last week I've taken time to start reading again. 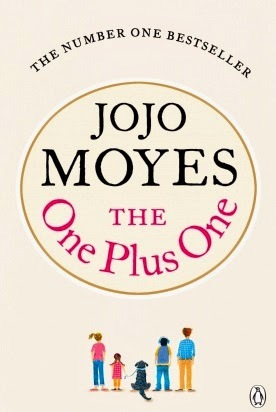 I kicked off with the excellent thriller 'The Boy That Never Was' by Karen Perry - great title by the way - followed by 'The One Plus One' by Jojo Moyes. I first delved in to her output with 'The Last Letter of Your Lover', a gorgeous romance / lost love story. Following that I zoomed through the brilliant 'Silver Bay', 'The Peacock Emporium', 'Foreign Fruit' and picked up her last three releases as they became available. 'The One Plus One' is a story about two families of disconnected people with lives falling apart. It's fascinating how they reconcile some of their problems and attempt to make things work and how their relationships intertwine and will it all work out in the end? I love the characters, they are brilliantly constructed and believable. The differing points of view are written wonderfully, I went through each one with empathy, sympathy and hopes and frustrations.